Wilco played four nights at the Chicago Theatre this past February, and I was fortunate enough to attend every one of those shows. While all of them were great, the first night might have been the greatest Wilco show I’ve seen in a long while, maybe ever. Not only was the band pitch perfect with every note, but the setlist, comprised of more than half of their seminal Yankee Hotel Foxtrot album along with a bunch of tracks that let Nels Cline rip guitar solo after guitar solo, felt like it was chosen exclusively for me. Sometimes a great live show happens when you least expect it. I’m admittedly not the biggest Cap’n Jazz fan. The couple of albums of their I’ve heard haven’t really done all that much for me. Yet such a big deal was being made about their reunion performance at Riot Fest I couldn’t help but be drawn in. Turns out there was fire associated with that smoke, as the band turned in what could only be described as a madcap show of epic proportions. There was lots of crowd surfing. Clothing was removed. Microphone stands and tambourines were molested. At times it felt like Tim Kinsella was doing stand-up comedy material in between songs. At no point was I bored, and it became clear there was much more heart behind Cap’n Jazz songs than I once thought. You still couldn’t call me a fan, but I’d go to another one of their shows in a heartbeat. Have you ever been so dialed in and focused on something that you have what some might describe as an out of body experience? It’s not something that happens to me often, but the right scenario with the right artist can pull you down a powerful and moving path you might not have expected. When announcing the show at the start of 2017, Haley Fohr (Circuit des Yeux) mentioned it would be a unique solo performance presented as a singular, hour-long piece of music. Shrouded in darkness with only candles on the floor surrounding her microphone, the rich tapestry of songs hit me so hard it took awhile for me to figure out what happened afterward. The world’s best bar band performed at one of the world’s best bars. The Hold Steady hadn’t played a show at the tiny Empty Bottle since their Separation Sunday album more than a decade ago, but for one special night in celebration of the Bottle’s 25th anniversary they were back and armed with an array of wildly fun songs you couldn’t help but shout along with. The atmosphere was absolutely electric as sweaty bodies jumped in unison while handfuls of confetti were thrown about with wild abandon. To quote one of The Hold Steady’s own song titles, it was a Massive Night. You know that feeling you get when you suddenly discover a new favorite band? Where a particular song or performance floors you because it seemingly came from out of nowhere? Seeing Priests for the first time on a cold night in February was a genuine revelation. Their album Nothing Feels Natural had only been out for a couple of weeks and I was still getting acclimated with it, but that show pushed me to keep it on repeat for much of 2017. What’s great about their live show is that all four members display an explosive energy and passion for what they’re doing, and that in turn gets the crowd amped up in just the right way. 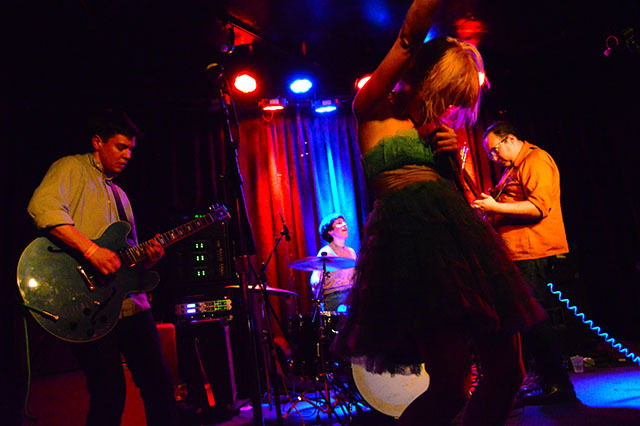 While Katie Alice Greer is the vocal center of the chaos, jumping and spinning and throwing exaggerated tantrums as each song requires, shifting your attention to GL Jaguar, Taylor Mulitz, or Daniele Daniele reveals equally compelling work being done. Even after seeing Priests twice in 2017, I can’t wait to see them again. The couple of times I’ve seen Cage the Elephant in the past, their performances were solidly good. One of my friends actually told me he was bored the last time we saw them (though I disagreed). But at Lollapalooza 2017, of all places, Cage the Elephant managed to shock, surprise, and delight me with their set. Playing in the early evening on Thursday a couple of hours before the headliners, the band put on such a wild and energetic performance it made me think of The Rolling Stones in their prime. Singer Matt Shultz came out wearing a dress and fishnet stockings, and things only spun more out of control from there. Since they’ve been managing to achieve radio hit after radio hit for the better part of the last decade, much of their set list was comprised of songs everybody already knew and loved, which only drove the energy higher and led to huge sing-alongs. If they’re not big name festival headliners at Lollapalooza and elsewhere within the next couple of years, then something has gone terribly, terribly wrong. The last couple of years have been a strange struggle as I’ve attempted and failed to see Sylvan Esso on multiple occasions. They must have come through Chicago a good four or five times, and something has always prevented me from going to the show. This past summer I vowed to put an end to that trend, and bought tickets to see them at both Lollapalooza and the aftershow they had scheduled at Thalia Hall the night before. While their festival set was quite good, it was the Thalia Hall show that I felt truly captured the power of the duo of Amelia Meath and Nick Sanborn. The sound was crisp and perfect, the beats slamming with the force of a boxer’s punch while the effortlessly smooth vocals slid and soared as needed. I felt tired going into the show after spending a long day at Lollapalooza, but somehow in my depleted state I couldn’t help but dance and just generally have a great time. I’ve got to say, the wait was worth it. 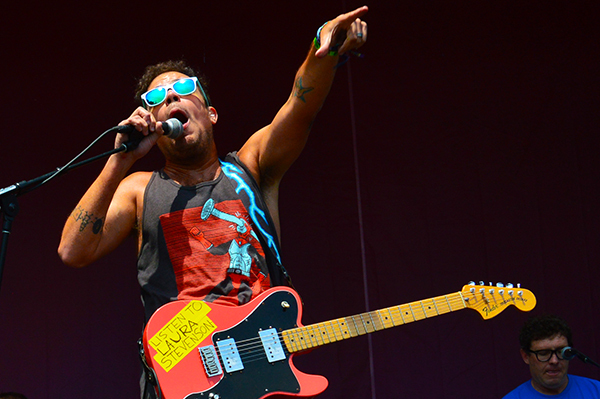 Prior to seeing Jeff Rosenstock perform at this year’s Pitchfork Music Festival, I wasn’t aware of his reputation as an underground punk legend. I had only heard his 2016 album Worry, thought it was great, and was intrigued about what his live show might be like. For those lucky fans who showed up in the early afternoon to see his set, it’s likely an experience they won’t soon forget. 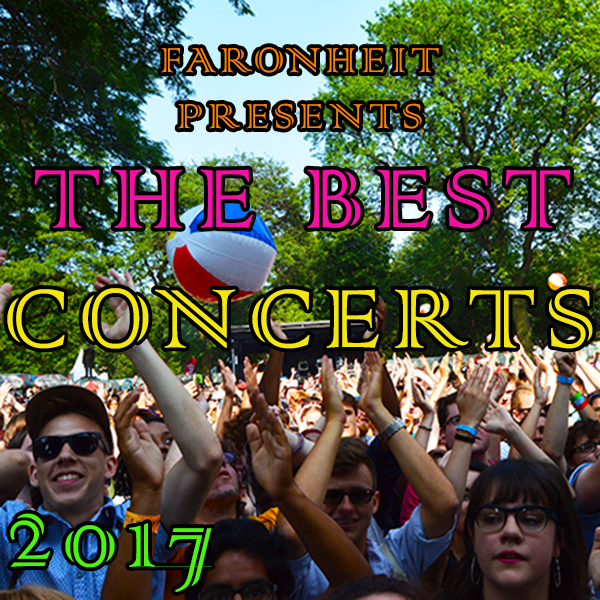 Rosenstock and his band walked on stage to a “Weird Al” Yankovic song, then thanked the person at Pitchfork who was fired for booking them at the festival. Things spiraled out from there, with stage banter that included criticizing the festival’s corporate sponsors, advocating for gun control, and best of all, telling everyone exactly how much he was being paid to perform. All of it was weird and hilarious and antithetical to just about any other set you’d see at a music festival. At one point he smashed a Donald Drumpf pinata with his guitar, before throwing it into the crowd to be torn apart. As for the music itself, the set was so high in energy and the crowd so into it that there were simultaneous mosh pits, crowd surfing, and (at Rosenstock’s insistence) people doing the wave. It might have been the most fun I had at a show all year. A band like Explosions in the Sky plays theatres. Their widescreen instrumental music is the sort of thing you want to experience in a large room with great speakers, so the sound can simply wash over you in waves. The Empty Bottle is most decidedly NOT that. As a tiny hole in the wall sort of venue with a capacity shy of 400, EITS regularly sell out shows at venues 10x larger. Yet here they were, for one special night as part of the Bottle’s 25th anniversary concert series, and on a tour they claimed would be their last before a long break. Without background video screens or fancy lighting, it was simply a bunch of guitars on stage with a drummer. The no frills setup meant the focus was on the music only, and it contained multitudes all on its own. Powerful yet graceful at the same time, they managed to take this tiny venue and figuratively tear down its walls by sending chills down the spines of everyone in attendance. My mind was being marinated in bliss for the duration, and after it was all over I felt both giddy and at peace despite all of the sonic violence that had occurred. What can I say about the first and last time I saw A Tribe Called Quest? 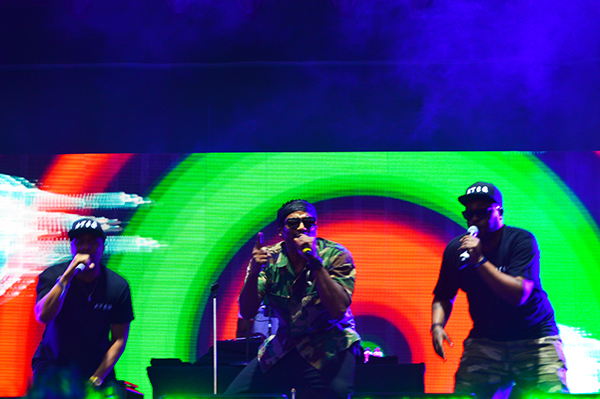 It was the first time they performed since the passing of Phife Dawg, and the start of a string of dates through much of the summer that they were calling a final tour. It was a chance to say goodbye, and anybody that saw them should be grateful for the opportunity. Instead of being a somber affair, the four remaining ATCQ members seemed to have boundless energy and attacked every track like it owed them money. The hits kept coming, and every time one of Phife’s verses came up, the guys would step back from the center of the stage and cede the spotlight to an empty microphone stand as his voice echoed out of the speakers on stage. It was great to see them honoring his legacy in that fashion while still managing to celebrate and party. It’s a comfort and an honor to know that they were able to go out on top.